SXSW Festival Premier of Thunder Soul at Paramount. Snoot Entertainment is proud to announce that director Mark Landsman’s film, Thunder Soul, on legendary band director, Conrad "Prof" Johnson, and the historic reunion of his internationally renowned Kashmere High School Stage Band, will premiere at the South by Southwest (SXSW) Film Conference and Festival in Austin, Texas, on Saturday, March 13 at 11am at the Paramount Theater. Additional screenings at the festival to be held Monday, March 15 at 6:45 pm at the Alamo Lamar and Friday, March 19 at 2:30 pm at the Paramount Theater. Joining Mr. Landsman at the film’s premiere will be Thunder Soul producers Keith Calder and Jessica Wu, and 30 of the original members of the band who are featured in the film. After the film's Monday, March 15 screening, The Kashmere Reunion Stage Band will perform live at SXSW, opening for T-Bird and the Breaks at the Austin Chronicle Film Party. 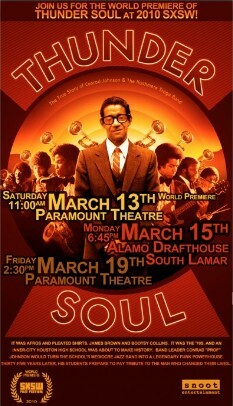 Thunder Soul follows the extraordinary reunion of alumni from Houston's storied Kashmere High School Stage Band, who return to their school for the first time in 35 years to pay tribute to their beloved leader--the 92 year-old "Prof"--who transformed the school’s mediocre jazz band into a world-class funk powerhouse. Snoot Entertainment, which produced Thunder Soul, is a motion picture production company founded in February 2004 to independently develop, finance and produce both commercial genre-oriented live-action films and CG animated features with broad audience appeal.